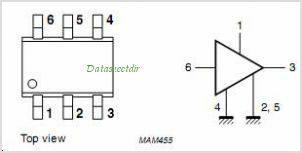 BGM1011 MMIC wideband Amplifier Silicon Monolithic Microwave Integrated Circuit (MMIC) wideband Amplifier with internal matching circuit in a 6-pin SOT363 SMD plastic package. This is one package pinout of BGM1011,If you need more pinouts please download BGM1011's pdf datasheet. BGM1011 circuits will be updated soon..., now you can download the pdf datasheet to check the circuits!